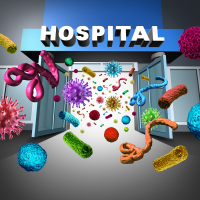 Just when you thought things were improving with hospital safety and health care associated infections (HAIs), new research shows health care associated pathogens remain active on all types of surfaces for extended periods of time. Research concerning high-touch objects in patient rooms has led to many product advances and innovations. They include new cleanable TV remote controls, copper-embedded IV poles, washable keyboards and even silver-impregnated privacy curtains all designed to reduce the bacteria burden. A study published in the “American Journal of Infection Control” detailed a survey of five Cleveland-area hospitals where samples were collected from patient room floors and found to be contaminated with dangerous pathogens. You may be thinking: are the pathogens just going to jump off the floor? According to the study, floors are now being identified as an underappreciated source for pathogen dissemination. Take, for instance, patients wearing non-slip socks. Testing found something as simple as the socks patients are wearing to be frequently contaminated with Methicillin-resistant Staphylococcus aureus (MRSA), Clostridium difficile (C diff) and vancomycin-resistant Enterococci (VRE). Changing the socks and then touching another surface, well, you get the picture, more items are contaminated. It’s not just socks. Other items are touching the floor and then picked up by people. Clothing, walking canes, shoes, purses, blood pressure cuffs and remotes all can touch the floor. The research found that 41 percent of the rooms had at least one high-touch object make contact with the floor. Based on this new research, an infection preventionist at a large hospital demanded the environmental services (EVS) department change the floor cleaning chemical to a disinfectant to combat the active pathogens. Soon, patients and staff were complaining of the floor’s “stickiness” from the disinfecting solution and a psychological feeling that something inappropriate was spilled on the floor. According to Darrel Hicks, EVS director at GCI Certified and author of “Infection Prevention for Dummies,” the issue of whether the floor should be disinfected is unresolved. According to Hicks, “the law of gravity turns floors into depositories of everything from soiled tissues, dust and microscopic organisms.”Hicks commented that combining a good neutral cleaner with a microfiber mop and a properly trained EVS technician would be just as effective and about one-tenth the cost of an in-use dilution of disinfectant. “Of course, arming the technician with a bottle of an intermediate-level disinfectant should reduce microorganisms to a safer level,” he said. The CDC Guidelines for Disinfection and Sterilization in Healthcare Facilities states that reasons exist for using a detergent alone on floors because noncritical surfaces contribute minimally to endemic health care-associated infections, and no differences have been found in HAI rates when floors are cleaned with detergent rather than disinfectant. Changes to health care floor care guidelines will likely be coming considering this referenced study whereby of the 100 occupied rooms which were studied, 41 percent had one or more high-touch objects that came into contact with the floor. Cultures were collected from the floors and from hands that had touched items which had come into contact with the floor. Contamination identifying Clostridium difficile was recovered from floors in 48 percent of the surveyed rooms. MRSA and VRE were also present in patient room floor samples, but at a significantly lower rate. Samples were taken from hands to determine the frequency of transference of pathogens from the floor to hands in the patient room after touching an item that was on the floor. Of the 31 bare hand or glove cultures, MRSA was recovered from 18 percent, VRE from 6 percent and C diff 3 percent. The best defense for the patient is making sure everyone in the room is washing their hands after touching items including the patient and visitors. Hand hygiene is recognized by IPs as the most important intervention in decreasing the spread of infection. Hands are vectors for transmission between both people and objects. According to the World Health Organization (WHO), health care workers should practice proper hand hygiene before touching the patient, after touching the patient and after touching inanimate objects in the patient’s surroundings. The principles of the safety protocol should be taught to the patient as well as others entering the room. The additional data presented concerning contamination transference from touching items that were picked up from the floor means a review of education practices is necessary immediately. Since new research and testing data are putting questions in the minds of infection preventionists and EVS managers new products and education programs will likely be developed or promoted. The cost of health care associated infections (HAIs) to both the patient and the hospital are driving the intense focus on the patient environment, and with the new research comes better practices to improve patient safety and healthier outcomes.